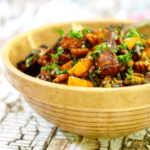 Easy, roasted sweet potato salad is packed with flavor from fragrant spices, tangy-sweet balsamic vinegar, sultry vanilla, and just enough smoky chipotle to make it tingle. A healthy side dish that's perfect for summer potlucks and autumn feasts! Click on the sweet potato link for the instructions on roasting sweet potatoes. Other links in this recipe are affiliate links to the product. Let sweet potatoes cool after roasting. Add the sweet potatoes and the rest of the salad ingredients to a large bowl. Pour the vinaigrette over all. Toss lightly, serve or chill for up to four days. Whisk ingredients together and allow to mellow for 20 minutes if possible. Pour over salad and allow flavors to mingle for at least an hour or up to three days.